A pair of paid add-ons hands you high-speed races and high-power weapons. 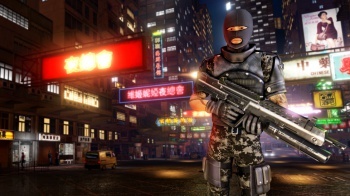 For those who simply can't get enough of Sleeping Dogs and its dingy, neon-lit portrayal of Hong Kong, developer Square Enix will launch the Street Racer Pack and Tactical Soldier Pack add-ons on October 16th. Each pack will set you back 320 MS Points on the Xbox 360 and $3.99 on both PlayStation Network and Steam. The Street Racer Pack adds - wait for it - new street races. These include a high-speed jaunt along the elevated Victoria Peak called Kamikaze, a motorcycle endurance race called Cross Island Enduro, and a watery ride called Harbor Run. The pack will also unlock a new Sting motorbike and dragon-themed racing apparel for you to use at your leisure. The Tactical Soldier Pack lets you fully outfit your character with the most protective armor available in the game, as well as the most destructive weapon - an assault rifle equipped with a grenade launcher. No additional story content is included, so you'll have to make your own mayhem around the city in order to drum up a sizable army of enemies to take down. This isn't the type of DLC you're probably used to seeing for an open-world game. For example, Grand Theft Auto 4 added entire story arcs after the fact with its Lost and the Damned and Ballad of Gay Tony add-ons. The bonuses included in this pair of Sleeping Dogs packs seem like a better bet for those who haven't yet finished the game. But regardless of how you intend to use the included unlocks, if you've been itching for a reason to return to the mean streets of Hong Kong, now's your chance.